Refrigeration is the process of removing heat from an enclosed space, or from a substance, and rejecting it elsewhere for the primary purpose of lowering the temperature of the enclosed space or substance and then maintaining that lower temperature. A Refrigeration cycle works on essentially the same principle that makes your hand feel cold when water is evaporating off of it. Other liquids, including some known as Refrigerants, produce even lower temperatures when they evaporate. The refrigeration cycle is a closed loop of gas which undergoes four stages. The first stage is the Compressor, which compresses the refrigerant to increase its temperature. The gas is then routed through the Condenser which releases heat outside the refrigerated space. As it dissipates heat, the refrigerant cools and recondenses into a liquid. This liquid then passes through a high-pressure/low-pressure threshold, called an Expansion Valve, which causes it to expand and change phases into a gas. The cold gas circulates into the Evaporator, absorbing heat from the inside, before being routed into the compressor again. The purpose of the refrigeration cycle is to take heat from the inside of the refrigerator and transfer it to the outside. 2. 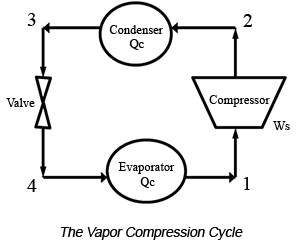 What is Vapor Compression Cycle? 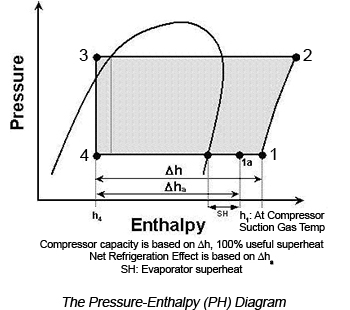 Vapor compression systems are employed in most refrigeration systems. Here, cooling is accomplished by evaporation of a liquid refrigerant under reduced pressure and temperature. The fluid enters the compressors at state 1 where the temperature is elevated by mechanical compression (state 2). The vapor condenses at this pressure, and the resultant heat is dissipated to the surrounding. The high pressure liquid (state 3) then passes through an expansion valve through which the fluid pressure is lowered. The low-pressure fluid enters the evaporator at state 4 where it evaporates by absorbing heat from the refrigerated space, and reenters the compressor. The whole cycle is repeated. 3. What is an Evaporator? Usually made of copper tubes and aluminum fins, this is where the working fluid absorbs heat from the surroundings which we intend to cool. Since this process involves a change of phase from liquid to vapor, this device is often called the evaporator. This is where the useful "function" of the refrigeration cycle takes place, because it is during this part of the cycle that we absorb heat from the area we are trying to cool. 4. What is a Compressor? A refrigeration compressor is a mechanical device that compresses low pressure refrigerant to high pressure refrigerant. It is called the “heart” of the system because it circulates the refrigerant into the system. 5. What is a Condenser? Also made of copper tubes and aluminum fins, this is where the heat being absorbed by the evaporator inside the cabinet will be discharged into the atmosphere, thus changing the high pressure gas refrigerant into high pressure liquid refrigerant (condensation). 6. What is a Thermostatic Expansion Valve? A thermostatic expansion valve (often abbreviated as TXV or TX valve) is a component in a refrigeration system that controls the rate at which liquid refrigerant can flow into an evaporator. This is accomplished by use of temperature sensing device that causes the valve to open or close as temperature changes in the evaporator. Refrigerants are the working fluids in refrigeration, air-conditioning, and heat pumping systems. They absorb heat from one area, such as an air-conditioned or refrigerated space, and reject it into another, such as outdoors, usually through evaporation and condensation respectively.